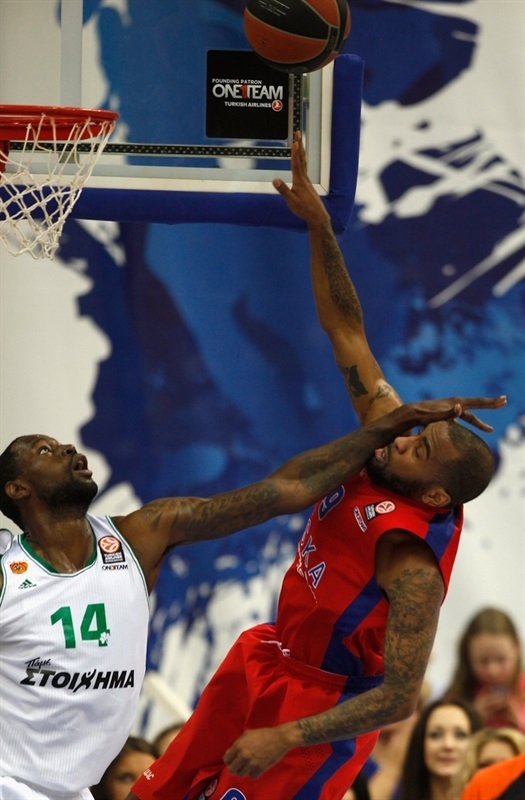 CSKA Moscow rose to the occasion by dominating rival Panathinaikos Athens 74-44 to win their best-of-five playoffs series and a spot in the Turkish Airlines Euroleague Final Four for the 11th time in 12 seasons. 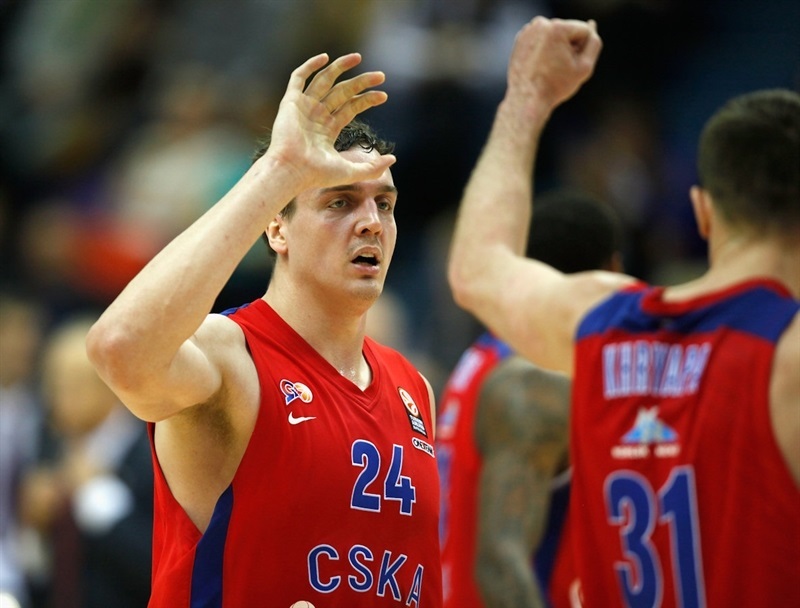 Sasha Kaun and Victor Khryapa led the CSKA attack at both ends in a game that was one-side for much of the night. 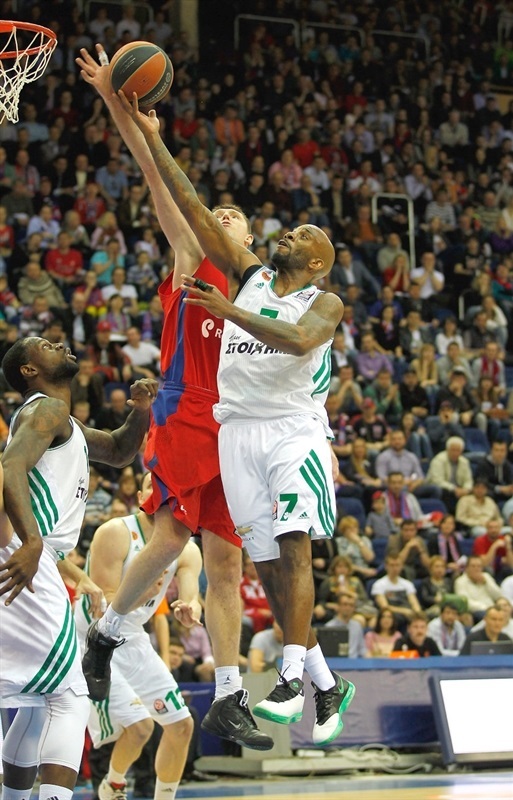 CSKA held Panathinaikos to a club record-low in scoring, which was also the second-fewest points by any club in playoff history. The 30-point margin of difference the worst defeat the Greens had ever suffered, too. Kaun took control early with 8 points and 4 rebounds in the first seven minutes. 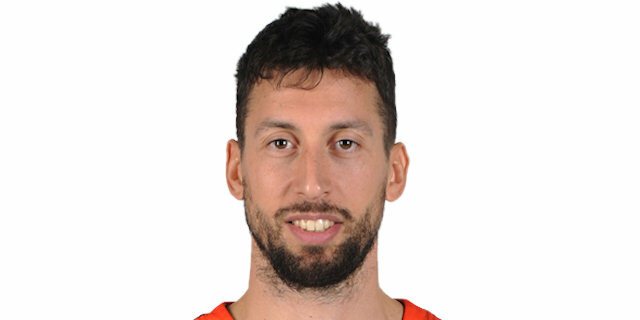 The lead swelled into double figures in the second quarter before Vladimir Micov highlighted an 11-0 charge in the third that gave CSKA total control. Kaun finished with 18 points on 7-of-9 shooting plus 9 rebounds and 2 blocks. Khryapa filled the box score with 10 points, 6 rebounds, 5 assists and 3 blocks in a fine all-around showing. 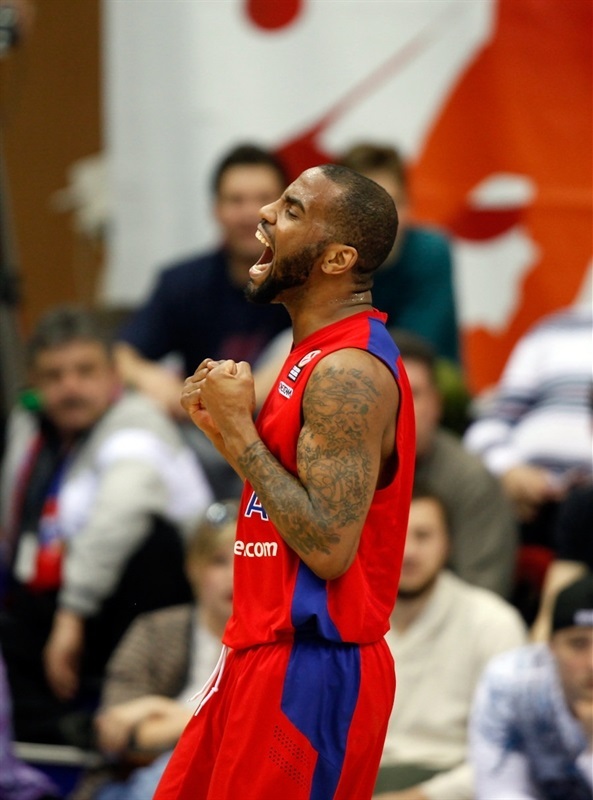 Aaron Jackson and Vitaly Fridzon added 9 points apiece and Sonny Weems dished 5 assists for CSKA. 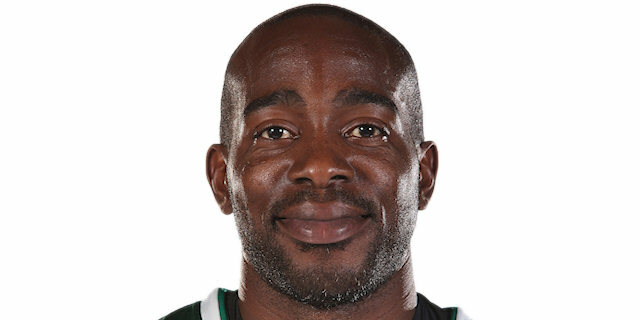 James Gist led Panathinaikos with 11 points and Loukas Mavrokefalidis and Stephane Lasme netted 8 each in defeat. Both teams missed a handful of shots before Sasha Kaun scored inside for CSKA and Lasme hit a short jumper for Panathinaikos. Khryapa assisted Kaun for a second time for a 5-2 lead. 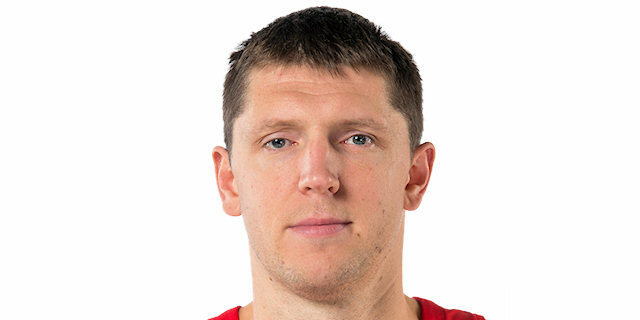 Roko Ukic sank a floater off the glass, but Andrey Vorontsevich and Kaun continued CSKA’s control inside with a pair of baskets to make it 9-4 midway through the quarter. Kaun scored his 8th point of the quarter on a lengthy two-chance CSKA possession. Jonas Maciulis scored 2 for the Greens from the line. Milos Teodosic made his return with three minutes to go in the quarter, but missed his first shot. Antonis Fotsis connected from downtown at the other end to make it 11-9. Zach Wright’s introduction helped the Greens pick up the pace; the point guard split free throws. Nice play between CSKA’s big men resulted in a Nenad Krstic slam and then a trip to the line on the ensuing possession. A Teodosic jumper made it 18-10 through 10 minutes. Teodosic drained a triple as CSKA took its first double-digit lead. 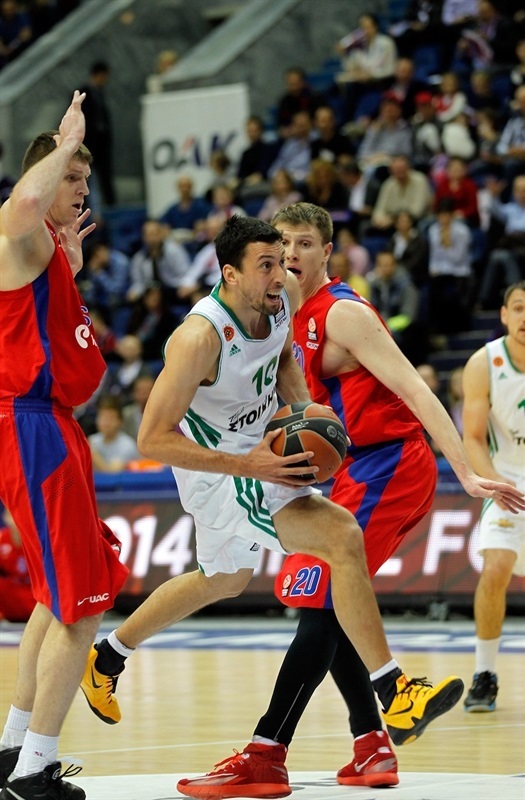 Gist responded for Panathinaikos and Mavrokefalidis added a baseline layup. Wright found Mavrokefalidis for a jumper that closed the gap to 21-16. The center backed his way in for another basket to cap a 0-8 charge for the Greens. Fridzon revived the home side with a three in transition. Wright denied Jackson a potentially momentum-building layup with a block from behind, but Panathinaikos did not capitalize on the other end. After the TV timeout, Jackson put CSKA up 26-18 before Mike Bramos hit from behind the arc. Khryapa answered with a three from the corner. Jackson was able to get inside and score an acrobatic layup to establish a double-digit lead. Khryapa and Kaun teamed up again for the center’s fifth basket. Khryapa rejected Ukic at the rim and Kaun tipped in a Jackson miss at the buzzer for a 35-21 CSKA lead at the break. Panathinaikos looked to roar back as Diamantidis found Lasme for an alley-oop slam to open the second half. Kaun added to his tally from the charity stripe. Bramos darted inside for a layup, but CSKA slowed the pace to its liking. Still Diamantidis found Lasme for a slam to bring the Greens within 10. However CSKA was back up 14 after a Micov triple. Kaun finished on the break and – after a timeout – Khryapa scored inside. Micov completed an 11-0 charge that all but sealed the outcome. Ramel Curry scored a tough layup for the visitors. CSKA piled it on with Kaun free throws to make it 50-29 followed by a Khryapa block of Curry. Mavrokefalidis and Jackson traded baskets. 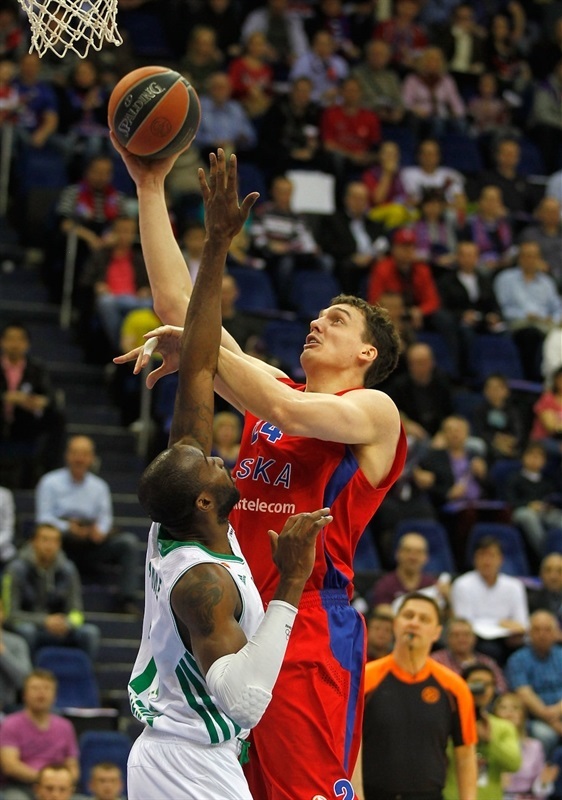 Gist scored inside too before his counterpart Krstic drained a jumper, which left CSKA ahead 54-33. Any Panathinaikos hopes were effectively dashed as Fridzon took a steal in for a layup and Weems scored from downtown – his first points of the game – to make it a 25-point game. Gist made a three of his own, but another Fridzon score and a Krstic block of Gist took the wind out of the Greens’ sails. Jackson converted a three-point play. A basket by Gist and free throws by Lasme did little to change the outcome. With victory clearly in hand, CSKA enjoyed the closing minutes and played freely. Teodosic added a jumper to take the lead to 67-40 as the fans started to celebrate and look for flights to Milan. "It was a great win obviously. First, I’d like to say that it was a great series against a great opponent. This rookie coach did everything to make our life difficult these two weeks. Second, I’d like to thank the players. We are having a difficult season. We never had a breath of easy life, we played all the most difficult opponents with the exception of Olympiacos. And today the players showed patience, played great defense, they chose all the options needed on offense, made the right decisions. Third, I’d like to thank the club and especially our president, Andrey Vatutin. He was close to us all this week, he showed his support and found all the right words for everyone. Fourth, a big, big thanks to all our fans. I remember that in difficult times, when we played Games 3 against Maccabi and Olympiacos in the past, they showed the same support. We are happy to have them behind our backs at these difficult moments. And I know they will be felt in Milan. Fifth, some words about my staff. I am very fortunate to have this fantastic staff around me here. This is one of big factors which makes me feel happy here at CSKA. Hopefully we will be able to do good job at the Final Four. Finally, I’d like to say that to get to the Final Four is a big deal this season. There were many more teams than usual who deserve to be in the Final Four this year. Many more than in any other edition of the Euroleague in past years. And one more thing. It was great to have Teo back today. He provided big help to us. Hopefully we will be able to stay healthy before coming to Milan. " "Congratulations to CSKA. Unfortunately this time we weren’t able to get into the game. After a great effort by the team in Athens, tonight from minute one, we felt empty. We came here 2-2, but we did not play the way we could. Except for Game 2 and Game 5 the players gave everything they could. Now our European season is finished and we have to concentrate on the Greek League." "Not one of our players expected an easy series. 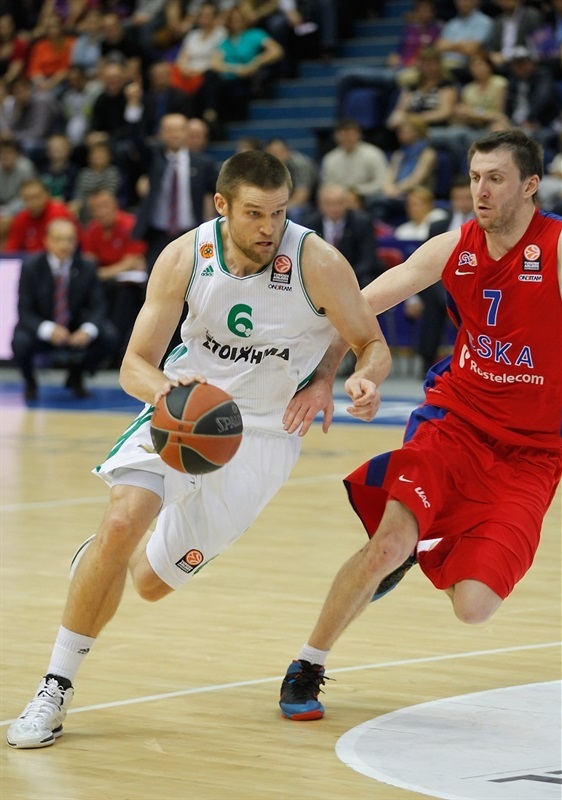 The two first games showed that Panathinaikos is always ready to fight. We won the first one in overtime only. Fans in Athens do not allow their team to play relaxed. The fifth game was won by the team that wanted the victory more. Next we have the Final Four, where each detail will matter a lot. " "CSKA was a better team today. They came out ready and won today. There were no problems, but we made some mistakes on offense and defense. So we lost the game. We always fight till the end no matter what happens and what the circumstances are. Our season is not over. We have to focus on our next goals." "CSKA was just a better team today in every part of the game. They deserved the victory. We never found our rhythm during the game. It finished as it finished. We couldn’t score anything in the paint. At the same time they scored everything from our paint. It was more physically difficult for us."